Don't you just love that cover? I love the covers for this series. I have wanted to read this series for ages, just based on the covers. Sadly, it's not quite going to work out between us, but I still love the covers. I am trying to think about how to talk about this book without sounding like I disliked it. Because overall I quite enjoyed it, in the same way I quite enjoy scarfing down half a bag of delicious kettle-cooked potato chips when I get home from work sometimes. I don't even take off my shoes. Sometimes I don't even hang up my purse. I just stand there in the middle of the kitchen and hoover. I should be embarrassed by that, but I'm not. So in the same vein, I'm not particularly embarrassed that I essentially hoovered this book. I really did read it in the same way that I eat those chips: extremely fast, sometimes even without tasting it, and occasionally just standing or sitting in terribly uncomfortable positions, but not really noticing. I am realizing that this is the way I read novels with significant suspense or thriller elements. I don't even necessarily enjoy them, at least not in the way that I enjoy other books. "Enjoyment" is maybe not the right word for the emotion that accompanies the above actions. But I absolutely need to know what happens. And I need to know as fast as possible, and I am in this crazy, uncomfortable mind space until I finish the damn thing, either while I'm reading it or especially while I'm not. It makes it difficult to write anything coherent or interesting about the book, I think. Because I am in the weird position of having... maybe?... liked the book, but also kind of detesting it for what it did to me. So, summary: Violet Ambrose, sixteen years old, is dealing with two major dilemmas: her sudden more-than-friend feelings for her absolute best friend in the world, Jay, who grew from a gangly teen into an incredibly handsome young man over the course of a summer; and her ability to sense dead bodies. This ability starts to cause her significant problems when a serial killer shows up practically on her doorstep, and girls and young women start disappearing and dying. 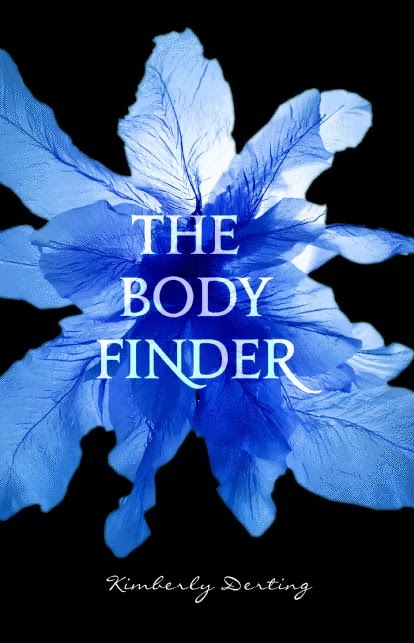 Violet can find their bodies -- and it turns out she can find their killer, too. And let's see. I liked Violet; she's a strong character, with a great voice, and a good balance of strength and vulnerability and flaw. I liked the way her paranormal sensitivity is dealt with -- it's well done, consistent, and kind of a cool ability in the sense that boy am I glad I don't have it. I liked her parents, her close and supportive relationship with them, her relationships with her friends. I really enjoyed the relationship with Jay, and was incredibly relieved that the vague appearance of a love triangle went absolutely nowhere, as I particularly hate love triangles and YA is rife with them. The dialogue was entertaining and snappy and felt realistic anyway. In fact, if this hadn't been a thriller, but just about Violet and Jay and their friends and their relationship, I think I probably would have enjoyed myself more. I'd have taken my time. I'd have savoured things. But alas. The action was movie-scene larger-than-life, which I expect from a suspense novel; Violet gets into scrapes and generally needs a bit of rescuing, which is a bit frustrating but again, kind of expected. She's a little bit horror movie heroine -- for god's sake, tell someone where you're going, you moron, or better yet don't go at all -- but again, kind of expected. In fact, a lot of things were just as expected, and maybe that's where I start to feel a little... bloated? The suspense kept me reading, but not because I really felt like I was loving the book. The convention Derting uses, of setting some scenes from the point of view of the killer, is used quite effectively here in a certain way; sometimes villain p-o-vs get a little campy or ridiculous. Here, he is really awful and creepy. For that reason, it's a convention I don't really like; I don't feel any sympathy for the guy, reading from his perspective doesn't increase my understanding of him, really, other than to build suspense when we know that things are just going to go from bad to worse. Actually, what bothers me about books that include scenes from the villain's point of view, when the villain has nothing to offer or to recommend him, and the scenes from his perspective are just to show the reader how truly evil he is, is that they're manipulative. I am an easily manipulated reader. I don't tend to notice when I'm being manipulated, always, so it takes a bit of a clumsy hand to tip me off -- and I was tipped off a couple of times in this book. There was one really egregious example, where a villain's p-o-v section and a Violet p-o-v section coincide closely in a way that is clearly intended to make you think that maybe Violet's in serious, serious trouble. She's not. I knew that pretty much immediately. And I found it irritating that I wasn't deceived, that the trick was so obvious. It made the Violet scene not nearly as emotionally effective as it could, or should have been -- because when I know how I am supposed to feel (relieved? happy? I guess?) but I don't, the writer hasn't done their job. And it's emphatically not that Derting is an ineffective writer most of the time. I think she's quite good for the genre, generally. I think that all that is wrong with this book is that it's a genre that is not really for me, or at least, it's not the best thing for me. Like a bag of potato chips, it leaves me feeling over-stuffed and under-nourished, which isn't a terrible thing once in a while, but it's also ultimately forgettable and leaves me feeling vaguely like I've just spent an afternoon doing something that wasn't quite worth my while. Recommended as a try for fans of YA romance (it's a solid one, predictable and enjoyable for that aspect) and definitely suspense; it's not so much a mystery as a thriller. The fantasy aspect -- Violet's unusual ability -- is a part of the plot and the character, but is so well-done that it doesn't feel far-fetched or fantasy-like, and therefore this might be a good entry for someone interested in reading a bit of the paranormal romance stuff out there without getting into a story where one would have to have an understanding of the genre and its conventions to buy what is going on. I probably won't be continuing with the series, although if I needed something for an airplane or a bus ride and the second book was handy I wouldn't be unhappy to pick it up.